Religious doctrins « The Male and God Plagues! All of the prevailing reasons why men go to war—religion, the hunger for political power, the obsession with wealth, territorial ambitions, oppressive government regimes—should be eliminated by a coordinated universal effort that now seems to be so far beyond the ability of mankind that it is not even a dream. But that is exactly what at least ninety-five percent of the people on Earth want! So why can’t it be done? It can be done but it will not be done until religious and political leaders are no longer in the dark ages where ignorance, irrationality and inhuman behavior are the norm—the norm for them; not for the people at large—or until new more powerful forces transform the mindset of humanity…a phenomenon that is already underway. It is obvious that the material quality of life is primarily determined by knowing what to do and having the political and religious freedom to do it. This makes it imperative that all people be freed from the destructive religious, political and economic shackles of the past. It is also imperative that the excess-consumption syndrome be eliminated from the world’s economic systems, and that people be encouraged and helped to create life-styles that are physically, emotionally, spiritually and intellectually satisfying that are not based on excess material things. Ordinary people have to become revolutionaries, willing to resist and to fight the status quo, and force all of the established power centers to do what is com-mon sense and morally right for humanity and the Earth. The basic solution to the negative and destructive influence of male dominance and religious nonsense is fact-based gender-equal education. It had become more than obvious by the end of the 20th century that the American system of education was still stuck in the 1800s—that it was not educating children for the present challenges and that the decline in the economic, political and social fortunes of the United States could be traced in large part to failures in education. Most people were not blind to this failing but the built-in bureaucracy and mindset of the bureaucrats and politicians in charge of the system made it impossible to reform the education process in fundamental ways. However, on the fringes of the huge system there were efforts by many to bring both the process and content of education up-to-date. One of the most successful of these efforts was the Kahn Academy, a non-profit organization created in 2006 by Salman Kahn, a Bangladeshi-American graduate of the Massachusetts Institute of Technology who decided on his own to provide both students and teachers with an alternative to the failed system that was still based on methods and subjects that were over a hundred years old. Kahn’s website-based system provides over 2,600 video tutorials stored on YouTube and available free of charge to teachers and students. The lectures and illustrations on the videos cover mathematics, history, finance, physics, chemistry, biology, astronomy, economics and computer science. The tutorials encourage students who are faster learners than others to act as personal tutors to their own classmates…something that makes the class-rooms lively places that resemble game rooms where the game is learning. The system takes into account that all students are different; that they have different learning capabilities and different personalities, and learn at different speeds. It also benefits from the fact that kids learn faster from interacting with other kids than they do listening to teachers lecture and reading books that are not interactive. In other words, the system of teaching is personalized and customized for individual students—some-thing the traditional system has not and cannot do. By the end of the first decade of the 21st century it was already obvious that technology was reshaping the model of education; that little by little teaching in most categories was transitioning into facilitating the use of technology—much of it in the hands of students them-selves. This is already having a fundamental impact not only on how students learn but what they learn be-cause they are no longer chained to the institutionalized and ritualized methods and sources of learning. The future of both old, traditional teaching materials and teaching styles will hopefully be short, and this could be one of the fastest cultural transitions in the history of mankind. This transition in teaching and learning can help lead to the reforming of all elements of the cultures of the world if it is allowed and encouraged to continue. before starting to improve the world! Boyé Lafayette De Mente has been involved with Asia since the late 1940s as a member of a U.S. intelligence agency, journalist and editor. He is a graduate of Jōchi University in Tokyo, Japan and Thunderbird School of Global Management in Glendale, Arizona, USA. In addition to books on the business practices, social behavior and languages of China, Japan, Korea and Mexico he has written extensively about the moral collapse of the U.S. along with books on his home state of Arizona. To see a full list of his books go to: www.authorsonlinebookshop.com. Recent books include: CHINA Understanding & Dealing with the Chinese Way of Doing Business; JAPAN Understanding & Dealing with the NEW Japanese Way of Doing Business; THE MEXICAN MIND – Understand & Appreciating Mexican Culture! ; AMERICA’S FAMOUS HOPI INDIANS; ARIZONA’S LORDS OF THE LAND [the Navajos]; SPEAK JAPANESE TODAY – A Little Language Goes a Long Way! 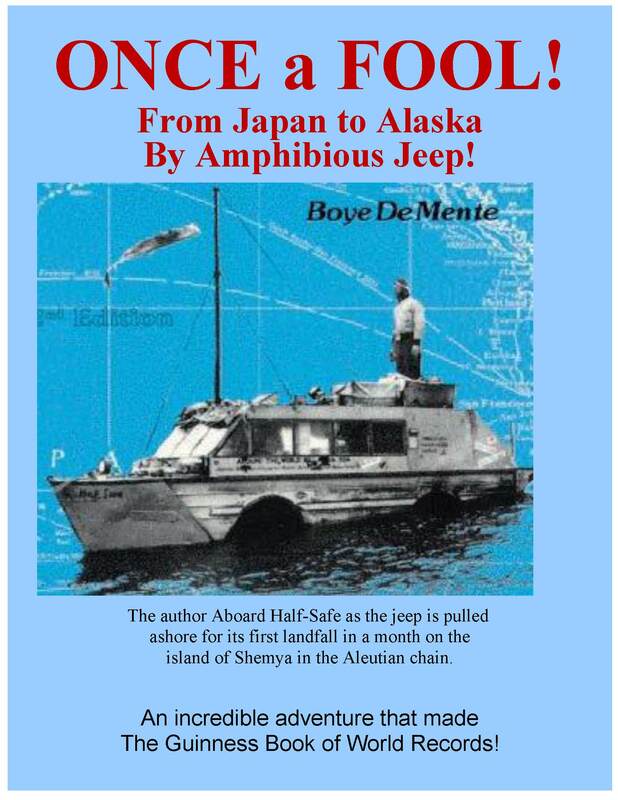 and ONCE A FOOL – From Japan to Alaska by Amphibious Jeep.